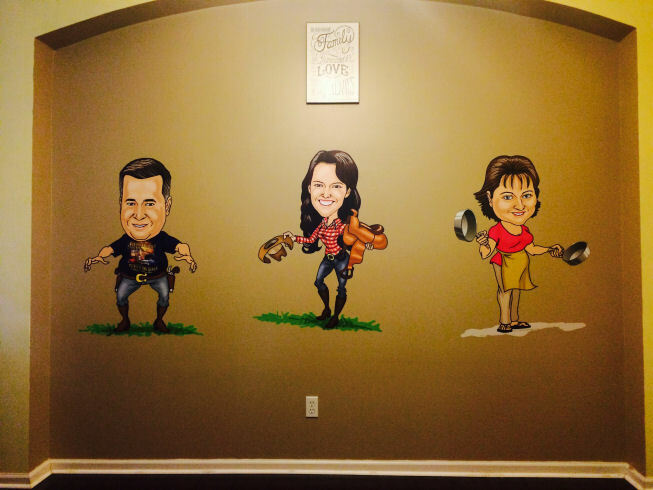 Caricatures big enough for your wall! How big can you print a caricature? That was the question asked by one customer about our caricature art. I assured him it was possible to print big. Our caricatures are delivered at 300 dpi providing plenty of scope for many printing situations. Taking advantage of that fact he ordered three caricatures online and artist Luis created three amazing caricatures for the customer to get them printed as special large decals to feature on a wall. The client was pleased and we were pleased to see such an outstanding result and a great innovative use of a caricature artwork. If you would like a great custom artwork, simply order a caricature online and select the artist style you like and that online caricature artist will create a wonderful caricature that is great idea for a birthday gift, retirement gift, wedding gift, engagement announcement, wedding invitation etc…we have many great ideas on the caricatureking.com website. Our online ordering process is 4 simple steps and then email photo’s and instructions and we start work.